For all those people who are interested in the Junior Eurovision Song Contest, here are the results and details for 2006. The fourth Junior Eurovision Song Contest took place at Sala Polivalenta in Bucharest, Romania, on Saturday 2 December 2006. The contest last just over 2 1/4 hours. Andreea Marin & Ioana Ivan hosted this event. During the interval, 2005 winner Ksenia Sitnik from Belarus sang the winning song and also many dancers. 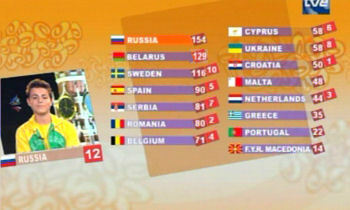 The winner was decided by televoting, as like the main Eurovision Song Contest. Only this time, the voting lasted through the contest and not tied into 10 minutes after all the songs were heard. The 2007 host will not be the winner of the Junior 2006 contest. The host for 2007 Junior Eurovision Song Contest will be held in at the Ahoy' Rotterdam venue in Rotterdam, Netherlands on 8th December 2007. The Junior Eurovision Song Contest will be released on DVD. Out second week of December 2006. Here are the songs and artist who entered the 2006 Junior Eurovision Song Contest and their final score. United Kingdom decided not to enter the 2006 contest for UK viewers had to watch the contest via the internet or sky channel TVEi 802 at 19:15 to 21:30.